In a style reminiscent of the Venetian palazzo of the same name, the Ca' d'Oro pendant is richly decorated with cracked gold foil submerged under a glass exterior. 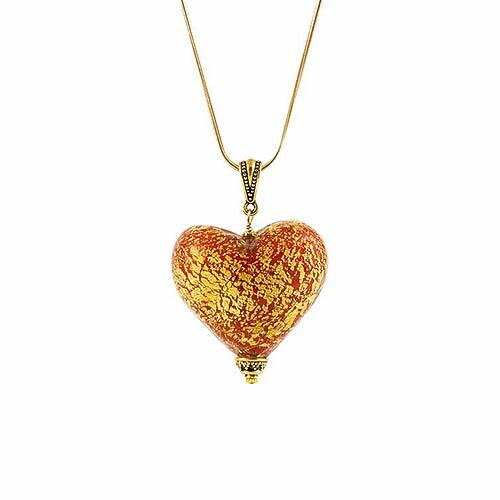 If you like the look of our Ca'd'Oro heart pendants, but prefer smaller pendants, then you may want to try this one. At approximately 1 3/4 inches in length from the bottom of the heart to the top of the bail, this pendant is only a quarter inch shorter in length, but nearly half the volume of the larger version. Color shown: Red and Gold. Shown here with an 18" gold-filled snake chain. Sold separately.